Additional Info: Seating on deck area in addition to large outdoor lawn area and table and chair seating and garden. Haven passes are NOT included. Only those named on booking form may sleep in the caravan. The balance is due 6 weeks before your arrival date, along with a £50 security deposit, which will be returned to you 7-14 days after your holiday, as long as the caravan is left in good order with no damage or breakages so that it can be enjoyed by other guests and our family. Any damage in excess of £50 will be invoiced and must be paid for.. Dates advertised are for 3 and 4 day breaks, however consideration will be given if interested in 7 night breaks. Please specify how many nights stay you are interested in and provide dates required in your enquiry. Many thanks. 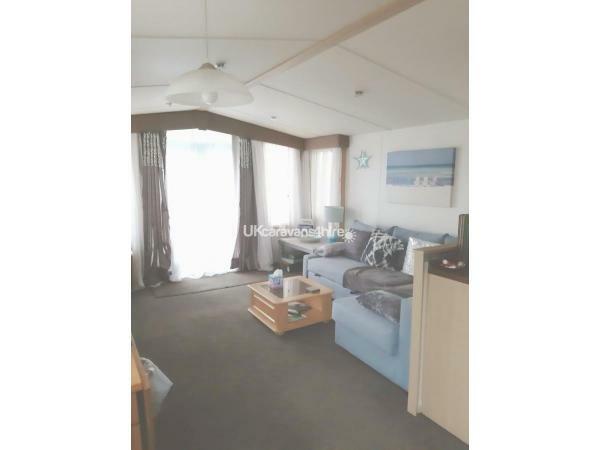 2 bedroom caravan for private hire on Weymouth Bay Holiday Park, situated in Preston, Weymouth, Dorset with full double glazing and central heating throughout. 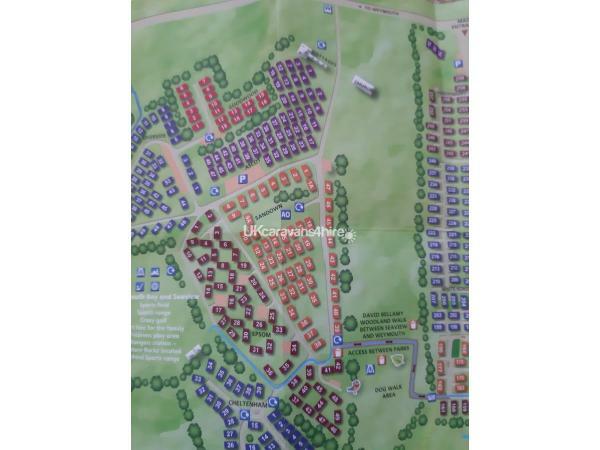 It offers the use of all of the Park's amenities and that of its sister park 'Seaview' situated next door. 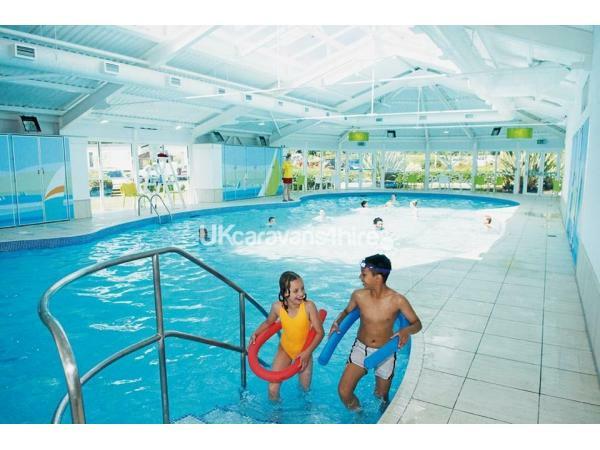 The amenities include swimming pool with lazy river, restaurant, bars (upon purchase of Park passes, not included in hire of caravan), on site Papa John's pizza, shop, launderette and close to Bowleaze Cove beach. 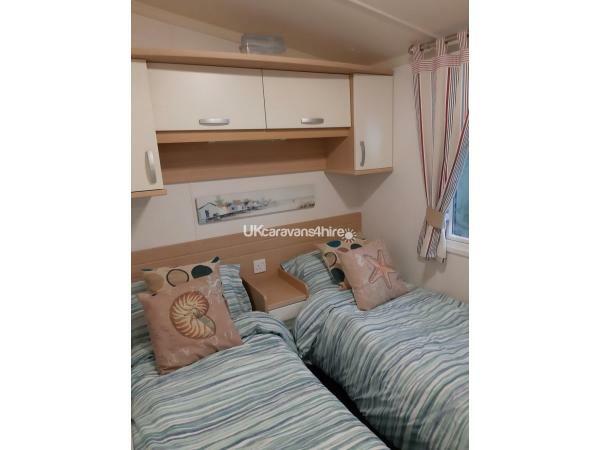 The caravan has 2 bedrooms; the master bedroom has a king size bed and en-suite toilet with wash basin, along with a dressing table and plenty of wardrobe storage. 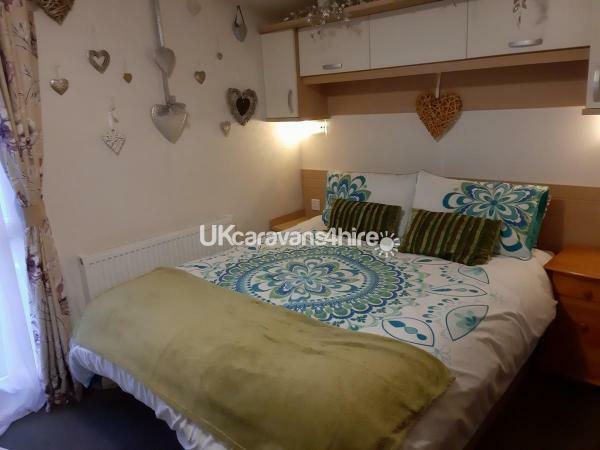 The second bedroom has twin beds (which can be pushed together), bedside table, bedside lamp and small wardrobe and additional overhead storage. There is a further pull out sofa bed which sleeps 2 in the lounge, if needed. A selection of tea & coffee are available for guests on arrival. The main bathroom has power shower, wash basin, toilet and storage. The kitchen has everything you need including a cooker, full size fridge/freezer, microwave, toaster, kettle with a full complement of cutlery and utensils, pots and pans. There is a dining table and chairs to enjoy your meal. The lounge has a 4 seater 'L' shaped/corner sofa with an ample sized TV, DVD player coffee table and occasional lamps. Patio doors lead onto a deck with overhead lighting and occasional table with a couple of chairs. In addition there is a patio area with additional seating and a well maintained garden area. £100 damage deposit is payable at the time of booking. 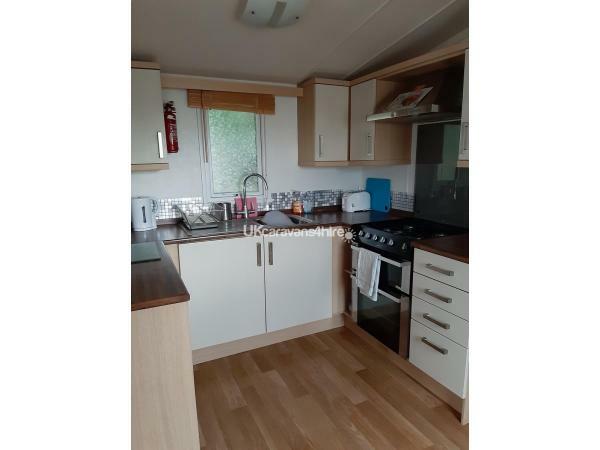 This will be returned upon inspection following your check out, providing the caravan left in a clean and tidy condition with no loss, damage or breakages. Full payment is required 6 weeks prior to the holiday start date. 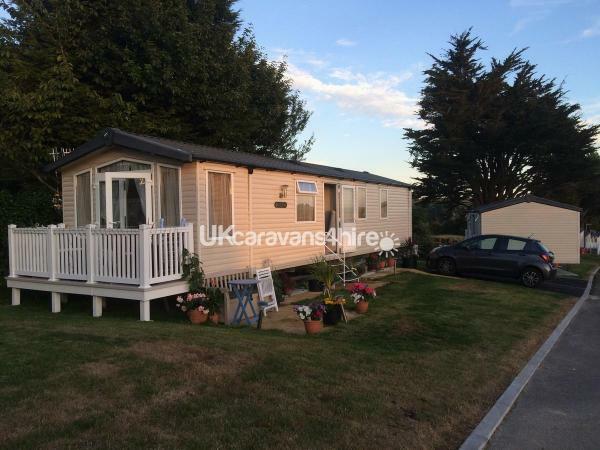 The caravan is located conveniently close to the rear entrance to Weymouth Bay Holiday Park in the Sandown area of the park. Easy access to bus stops and local amenities such as The Spice Ship public house, The Bridge public house, The SpringHead public house (a short walk away), 2 fish and chip shops, Co-Op, Spar and 2 beauty parlours. Access to Bowleaze Cove beach is a short walk through the park. 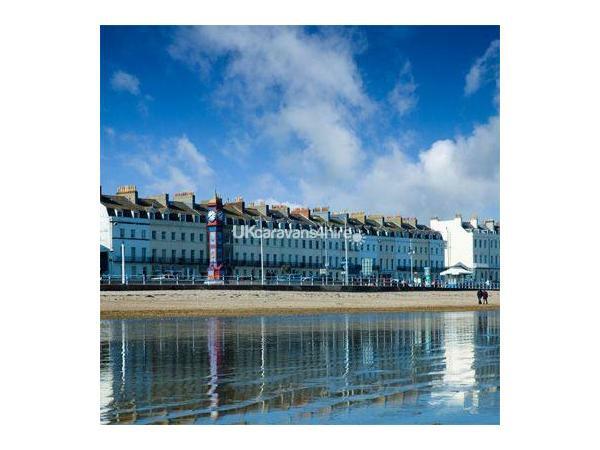 Weymouth is located on the Jurassic coastline with stunning scenery and offers a choice of beaches in the area for a traditional UK family beach holiday. Other attractions include Monkey World, Bovington Tank Museum, Lulworth Cove and Durdle door. 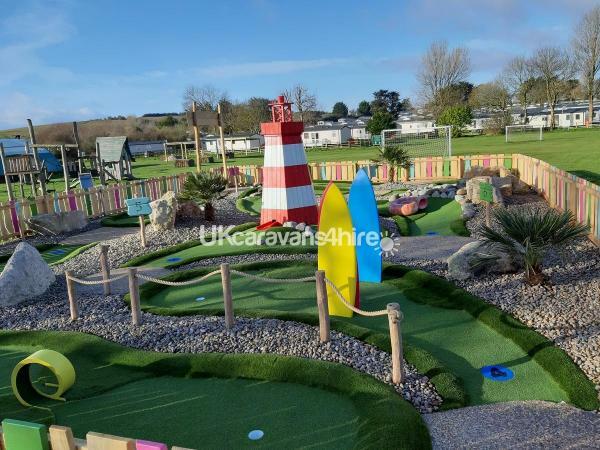 Additional Info: Restaurant, bar, live lounge with nightly performances, outside terrace and dining area, indoor heated swimming pool, baby pool, outdoor lazy river, amusement arcade, pedal cars, (new as of 2018 jungle gym and child's play area) with zip wire, bungee, crazy golf, football pitch, archery area.